As I'm sure you've noticed cranberries are a part of Autumn to me, for Thanksgiving and Christmas. Their bright red is so attractive in desserts and salads and even main dishes. I have a few bags of them that I'm slowly cooking and baking with because their flavor is such a great accent to food. 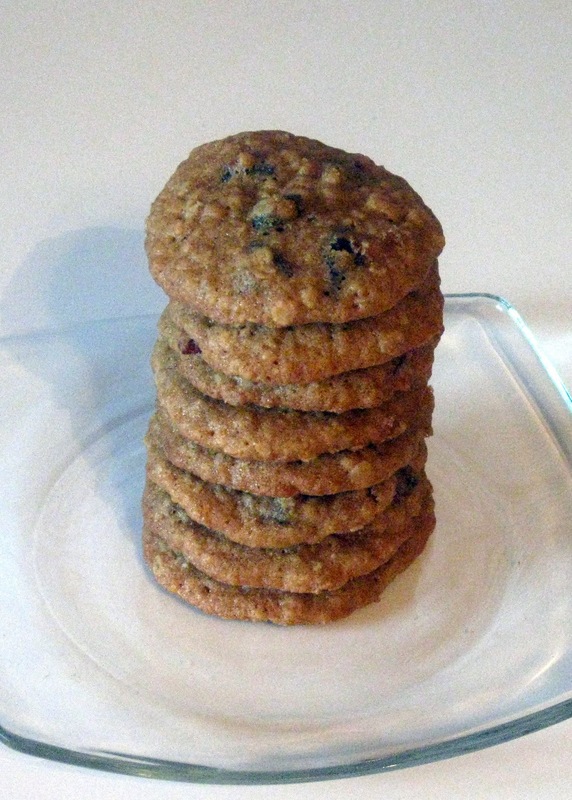 I love chewy cookies and there are wonderful and very snackable. I ate three within 10 minutes of them coming out of the oven, yum! They could have nuts in them but I made them without nuts. This is one of those recipes that is easy to alter if you like walnuts, pecans, or almond slices. It's also easy to have sweetened dried blueberries, peaches, cherries or apricots instead of cranberries. To tell you the truth I used cherry flavored cranberries in mine. It's what I had on hand because we had used all of our cranberry flavored cranberries. :) Happy Baking! This recipe has been submitted to the Blog Hop over at Meal Planning Magic for the 12 Weeks of Christmas Blog Hop. 1. In large bowl, cream together butter, sugar & brown sugar. Beat in egg, then add vanilla & pumpkin. 2. In medium bowl, combine flour,baking soda, salt & cinnamon. Slowly add the dry ingredients to the pumpkin mix. Once mixed add the oats. When oats are mixed add the cranberries. 3. Preheat oven to 350. Spoon balls of down onto baking sheet approx. 2" apart. Bake approx. 11 minutes. Those sound really good, I would like to try cranberries in my baking one day. Why have I never thought to put cranberries in my oatmeal cookies?? These sound sooo yummy! cranberries instead of rasins sounds interesting, will have to give these a try!